���The volcanosedimentary rocks that host the Au-rich porphyry Cu deposits of the Cadia Valley preserve the products of episodic volcanism that erupted into a large sedimentary basin. Volcanogenic sedimentation, including the Forest Reefs Volcanics, overwhelmed the fine-grained sedimentary component that characterized much of the Weemalla Formation. The Forest Reefs Volcanics evolved as a relatively low relief, multiple-vent submarine volcanic complex. The vents comprised mafic to intermediate lava flows, cryptodomes, and subvolcanic intrusions (dikes and sills). Stacked lava sequences, including hyaloclastites, massive lavas, and their reworked equivalents, are up to 1 km thick, forming significant intrabasinal topography. Explosive volcanism occurred during the late stages of Forest Reefs Volcanics deposition. These air-fall deposits, combined with coexisting shallow-water faunal assemblages, imply that volcanism became locally emergent. 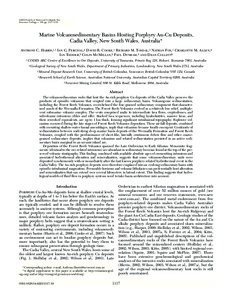 Continuity of sedimentation between underlying deep marine basin deposits of the Weemalla Formation and Forest Reefs Volcanics, coupled with the predominance of sheet-like, laterally continuous debris flow and other coarse-grained sedimentary deposits, implies that volcanism and related sedimentation persisted in an active sedimentary basin marginal to an oceanic island arc. ���Deposition of the Forest Reefs Volcanics spanned the Late Ordovician to Early Silurian. Monzonite fragments (identical to the ore-related intrusions) are abundant in sedimentary breccias found at the top of the preserved volcanic stratigraphy. This finding, combined with available absolute ages of crosscutting intrusions and associated hydrothermal alteration and mineralization, suggests that some volcanosedimentary units were deposited synchronously with or immediately after the last known porphyry-related hydrothermal event in the Cadia Valley. The Au-rich porphyry deposits were therefore emplaced into an evolving sedimentary basin with episodic intrabasinal magmatism. Permeable horizons and volcanic lithofacies can preferentially host alteration and mineralization that can extend over several kilometers in lateral extent. This finding suggests that hydrological models of fluid flow in porphyry systems need to take basin architecture into account.